August 15 marks the joyful anniversary of India’s Independence in 1947 and the tragic one of the atomic bomb over Hiroshima on 6th August 1945 that changed modern warfare and its possible outcome forever. In 1945, I was seven-years-old and lived in a spacious colonial bungalow of the Mysore State Railways allotted to my father, M. Venkatesh, an engineer. In the high ceilinged drawing room with teak beams, was a cabinet holding a prized possession — a radio. Wires for the aerial ran from it to the ventilator near the ceiling. 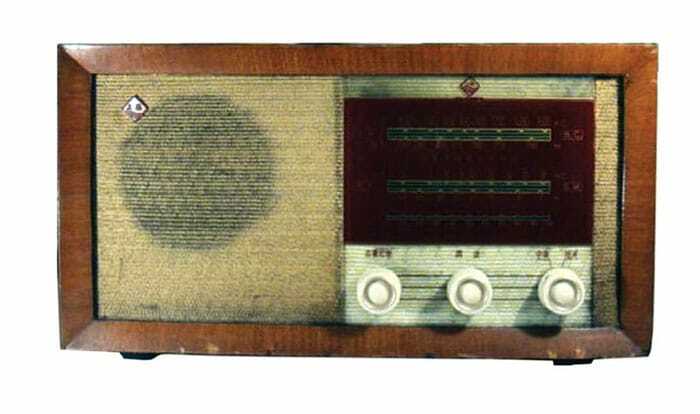 The radio was large with a polished wooden top, a central panel covered with a textured cloth. Underneath was a strip of illuminated glass with the names of stations (other markings and knobs for volume and search. The names were foreign like Hilversum and Grenoble. However, by adjusting the controls one could find stations of All India Radio. A Radio of the 1940s. One day, Father who as listening to the radio, suddenly called out, “They have dropped an atomic bomb on Hiroshima!” Mother’s stoic reply was that this would surely end the terrible war. Despite whispered conversations, enough horrific details came through for even a child to realise that this was a cataclysmic event for the world. In 1985, my husband and I went to Japan, posted to the Indian Embassy in Tokyo. Our stay there of three years was both educative and fulfilling. We travelled to see Mount Fuji, to Kumamoto Prefecture to view the active volcano of Mount Aso and the Ice Sculptures in Hokkaido. These were memorable trips but the poignancy of visiting Hiroshima remains in the heart. We travelled there from Tokyo by Shinkansen, the Bullet Train, a journey of about five hours. Reclining in comfortable seats, one hardly felt the movement of the train except for the blurred landscape flashing by. Young, smartly uniformed women attendants entered pushing trolleys of snacks, soft drinks and O-Sake (a Japanese wine) which is drunk warm to heighten the flavour. The cans had a tab; when broken a warming element was released in a compartment below, heating the wine perfectly. The attendants would stop by the door upon entering and departing, making a deep, graceful bow to the travellers with the innate courtesy of the Japanese. Hiroshima is in western Honshu, Japan’s largest island. In the Second World War Japan and Germany were Axis powers fighting the Allied Western countries. Hiroshima was an important railroad and port city and a military communications centre. The Germans capitulated in May 1945 but the Japanese carried on hostilities. An ultimatum to surrender was ignored. On Monday, August 6 1945, at 8.15 am an atom bomb, “Little Boy”, was dropped on the city by a B-29 Bomber, “Enola Gay” of the US Air Force to ensure Japan’s defeat. 70,000 people are said to have been killed outright with more deaths later from radiation sickness and injuries. Buildings were destroyed and much of the city flattened. The city of Nagasaki was also bombed later. We went to the Hiroshima Peace Memorial Park which was created at the site closest to the blast, a serene area with trees and flowers. A Cenotaph commemorates the war dead. 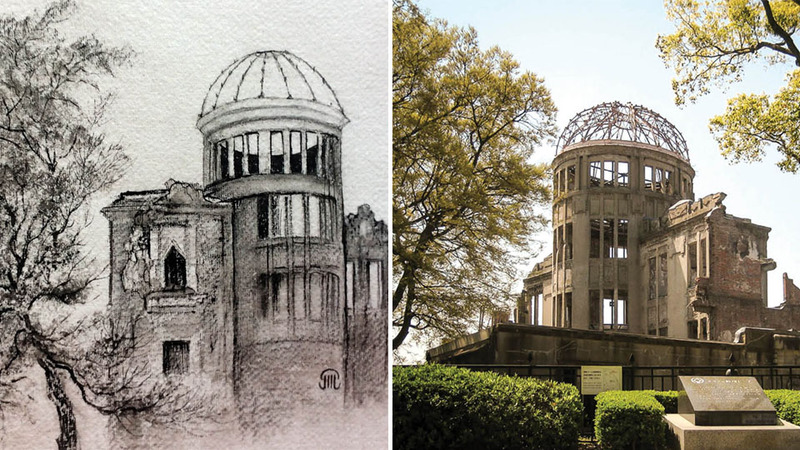 The skeletal ribs of the dome that topped the Hiroshima Prefectural Industrial Promotion building has been retained exactly as it was after the bombing. It is called the Genbaku or A-Dome. Entering the Peace Memorial Museum took us back to the aftermath of the bomb. Wax effigies bathed in an eerie light depicted tormented figures with skin and flesh hanging in ribbons from limbs. Photographs showed horrific burns, textile patterns seared into living flesh as well as examples of the effects of radiation. It was moving to meet the Curator, himself a survivor of the blast. I regret I cannot recall his name correctly; but I do remember an affable, elderly Japanese man in a suit and tie, speaking about his life before and after the bomb. A schoolboy at the time, he was in an enclosed room when the bomb detonated. When he came out, the world was transformed. The dead and dying lay among the ruins of the building, the landscape around the school was flattened and unrecognisable. He battled radiation ailments like nose-bleeds and other afflictions but overcame them to work for many years at the Museum. The heat of the blast vaporised human beings but left their shadows burnt into concrete walls and steps. There are many photographs that purport to show these ghostly records; a man with a walking stick and a man holding a ladder. The most touching is that of a child with a skipping rope, the last joyful moment of a life extinguished. The shadow of children skipping etched on a wall by the atomic blast. The Shadows of Hiroshima are etched in stone and concrete, they haunt the mind. May they ever remain Shadows, never again a Reality.